We have been cloth diapering for almost four years and it's funny how you can't ever get tired of finding new fluff! 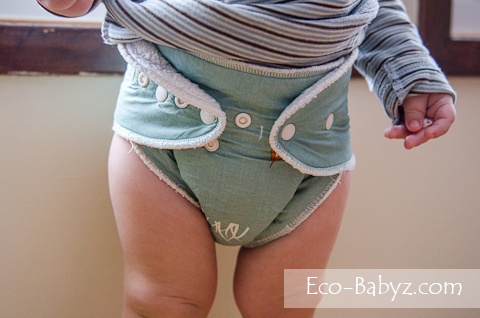 Our latest love are fitted diapers with wool longies or covers. I want to share with you the work of a wonderful mother and crafter with a big vision for a sustainable business. I've known Jessica since high school when we were just acquaintances and we later connected through social media when we were both expecting babies in different parts of the country. Baby E is about the same age as her son Elijah, who was her first inspiration to find a non-toxic and affordable option for his years in diapers. She has been sewing for over 15 years. You may recall our mention of Le Petit Owlet in our 2009 Etsy Gift Guide. Today you will find her creations under the name Little Fawn Organics. The professional quality fitted diapers, soakers, and longies are absolutely adorable. I love that they are all made from natural materials and are all in gender neutral patterns. After all, cloth diapers give you most value when you use them on more than one child, whether it is a boy or girl. It is super absorbent and a perfect night time diapering solution. The diaper we received is their night time fitted and can be used with a wool cover for a breathable overnight combination. It is composed of two layers of organic cotton sherpa and one layer of 100% organic cotton woven print, along with a 3 layer organic cotton sherpa insert. Our favorite way to wear this diaper is for Baby T to run around in it without any cover and I just change it when it feels wet on the outside. Especially now that he has himself shown initiative to go on the potty (crazy, at 15 months!) and is often dry in-between potty breaks. This is a great option in the summer, but when it gets chilly in the house I just slip on some wool longies on him. We love this breathable and all natural combination! "I just want to make it a family friendly, ethical work environment. A great place to work, a great product, and the quality of the goods we make will never be compromised so I can "save a buck", and if I get all of the funding, the cost of our diapers should be able to go down a bit, and I will have the resources to start a small program where I can donate some diapers to families in need. No matter what, our stuff will always be handmade, never manufactured. Which most cloth diaper companies can't say." Please consider supporting this growing, mom-owned business that has great potential to provide local jobs for other moms, to create a sustainable, reusable product, and to offer us moms a more affordable cloth diaper made of all natural materials. Currently, Little Fawn Organics Fitteds are sold for $30 a piece because they are not able to buy the fabric at wholesale prices for small production and the equipment needed to make production more efficient is costly. This campaign would enable them to jump-start the business and take it to the next level, in turn offering a more affordable diaper for the customer and even giving them the ability to donate some diapers to families in need! 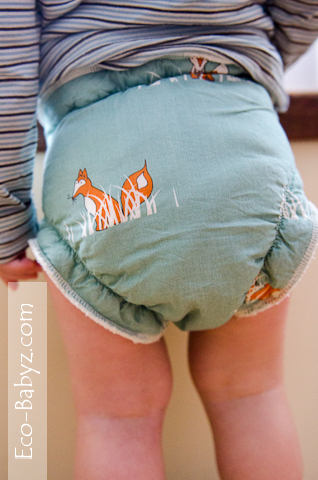 One of you will win a fitted cloth diaper during the New Baby, New Fluff giveaway Hop that starts March 6th! Come back Wednesday! What an adorable diaper! I've been wanting to try out a fitted one.